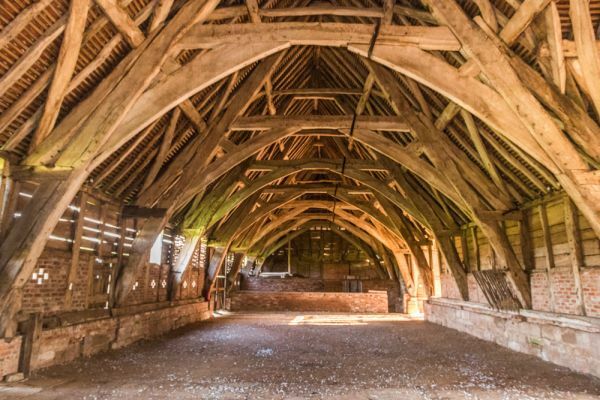 A medieval masterpiece, Leigh Court Barn is the largest cruck-framed building in England. It was built in the 14th century for Pershore Abbey and is 140 feet long and 34 feet wide, with a pair of gabled porches on the south side, and two cart entrances in the south wall. 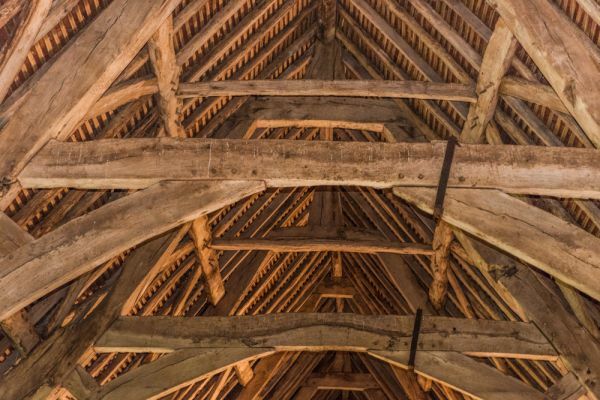 The huge tiled roof is supported on 18 cruck blades, each crafted from a single piece of oak. The 9 trusses measure 34 feet high and divide the barn into 10 bays. 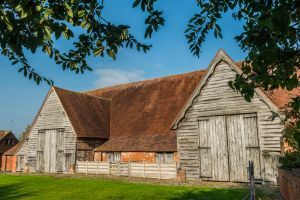 For years it was assumed that the barn was built in 1325, but recent radio-carbon dating suggests that trees for the barn were felled in the spring of 1344, several decades later that had previously been thought. It is not a tithe barn, though it is sometimes erroneously labelled 'Leigh Court Tithe Barn'. 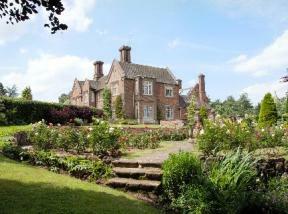 Rather it formed part of the grange at Leigh, directly owned by the monks of Pershore. 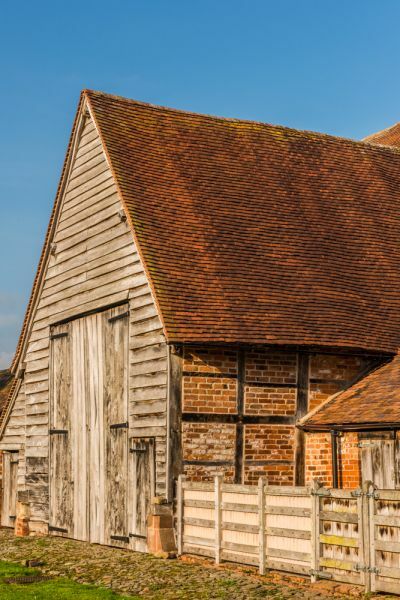 By comparison, a tithe barn was built to hold a 'tithe', a compulsory gift of a tenth of all locally produced goods - a tax levied to support the church, if you will. The barn is the only building to survive from Leigh Court manor. There was originally a complex of farm buildings and a residence where the abbot himself was known to stay occasionally. After the Dissolution of the Monasteries, the monastic buildings at Leigh Court passed into private hands. The barn continued its original use for centuries and has remained largely unaltered. Like most barns used for threshing grain, there were sets of doors on opposite sides of the building. Both opposing doors were opened at once to create a breeze. The area between the doors was made of flagstones and used for threshing the grain, tossing it high into the air so that the wind carried away the chaff and dust. Some of the original wattle and daub walling has been exposed in the north side. 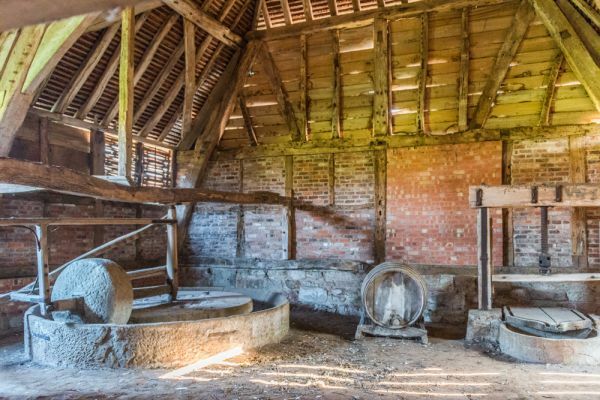 The last several bays of the east end have been subdivided to create a space for cider-making, with a huge stone trough for crushing apples, and a variety of historic cider-making equipment on display. The barn is not the best-signposted site I've ever visited. I drove right past the entrance on my way through Leigh and didn't realise it until I came out the south end of the village. Only after I drove back through the village did I see the English Heritage sign, set back from the road, just downhill from the parish church, beside a gated path that skirted the drive to the modern Leigh Court. There was no apparent parking place so I pulled off onto the verge in front of the church. I was there 10 minutes before the posted opening time of 10 am, so I waited, camera in hand, for someone to arrive and open the gate. Then I noticed that the gate wasn't even locked. I went through the gate, following the gravelled path, half expecting someone to pop out and ask what I thought I was doing on private property. No such problem; indeed, it didn't look to me as if the barn or the gate were ever locked. No one arrived during the time I was there, and I doubt anyone ever does. 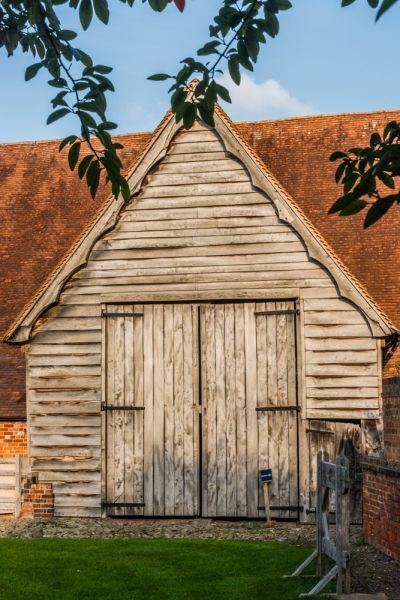 There is a small wooden door in the south wall, leading into a large bay, with a few information panels about the barn's history and its restoration. The only other information available was a plaque on the history of cider making in the area, and a small display on a restored wagon wheel, which was hung on the south wall. 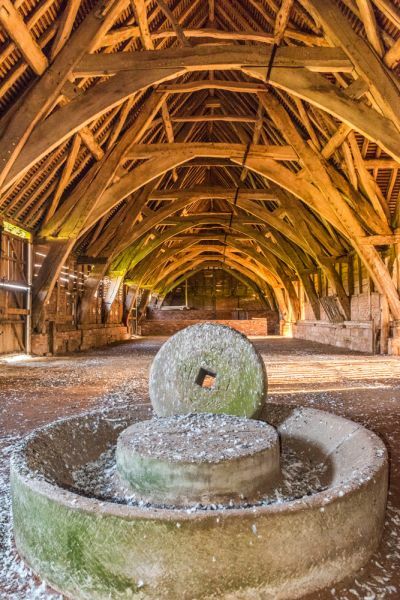 Though the experience of visiting would have been improved by more information about the barn and its history, the sheer scale of the building is so impressive that I really didn't mind. 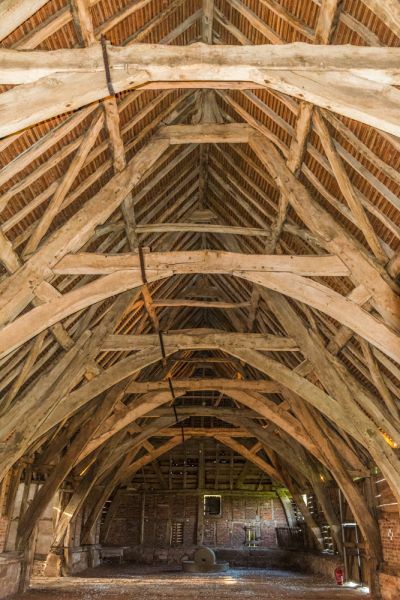 Walking into the interior of Leigh Court Barn gives you that same sense of awe you feel stepping into a cathedral; the building is simply cavernous, with a soaring roof of carefully bent cruck timbers and massive walls supporting the immense weight of the roof tiles. This truly is an exceptional historic building, a gem of medieval construction, and one of the most impressive historic buildings of any sort that you will find in England. Location: Seasonal opening only. Off the A4103 on a minor road, 5 miles west of Worcester. Free entry.